Investors Business Daily cites a George Mason University Study of the compliance cost of federal regulations which finds that those costs are truly staggering. Economists scratch their heads when asked to explain the economy’s tepid growth over the past several years. A new study gives a possible answer: the growing, cumulative burden of federal regulations. Under President Obama, annual GDP growth never once even hit 3%. Under Bush before him, there were only two years when growth topped 3%. But in the two decades before that, annual GDP growth was above 3% in all but six years. Growth has been so anemic for so long, we’re now being told that this is the “new normal.” As the Bureau of Labor Statistics put it, “annual U.S. GDP growth exceeding 3% … is not expected to be attainable over the coming decade.” It lists everything as a cause, except for one thing: federal regulations. Whenever a new regulation gets passed, the government puts out a cost analysis, which focuses on annual compliance costs. That’s fine for a point in time. But these regulations don’t go away. And every year more get added to the pile. The Code of Federal Regulations is now more than 81,000 pages long. What’s the cumulative impact of all these rules, EDIT3-regu-042616regulations and mandates over several decades? A new study by the Mercatus Center at George Mason University tries to get an answer, and what it found is mind-boggling. The paper looked at regulations imposed since 1977 on 22 different industries, their actual growth, and what might have happened if all those regulations had not been imposed. What it found is that if the regulatory state had remained frozen in place in 1980, the economy would have been $4 trillion — or 25% — bigger than it was in 2012. That’s equal to almost $13,000 per person in that one year alone. 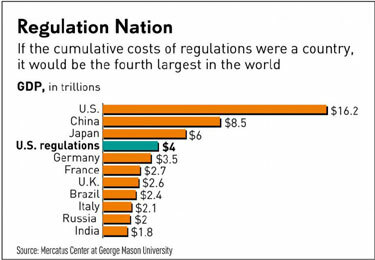 Looked at another way, if the economic growth lost to regulation in the U.S. were its own country, it would be the fourth largest economy in the world, as the nearby chart shows. 3 Feedbacks on "US GDP 25% Smaller Due to Federal Regulation"
Don’t show them this graph, they are liable to take even more! I could get our annual growth to 6% in a month. Set business income taxes to zero. Close the EPA, Education, Energy, HHS, labor, HUD, and require that any regulations already written by these Depts must be passed by congress to become enforceable. And investigate the IRS, State and the rest of the Departments of the federal government. The compliance costs for income taxes are in excess of 20% of the revenue collected. That means that for every dollar the government assesses in income taxes it imposes $1.20+ in costs. That also means that even if the government spent that money on something that had an economic return of 10% (ROFL), the net ROI for that action would still be negative. That is why economic growth is inversely related to the percentage of the economy that government takes. It is also an argument for sales taxes where, at least, the compliance costs are much lower.